3) family, friends, love and home–and a phenomenal pair of shoes–what more do you need? 4) I love–I mean really, really love–photographing intimate, outdoor, personal weddings and elopements. Introducing Angela + JB…Just Married! Angela and JB live on his family’s farm, which is a beautiful 100+ acre oasis hidden in the middle of the city. So much Southern history is built on our people’s land, and it was special to watch these two begin their own family history on this special piece of property. For the ceremony, it was just the two of them, their dearest friends who performed as officiant and official bouquet-getter/chauffeur/comic relief, and me. It was a precious time, and I was honored to capture it for Angela and JB. 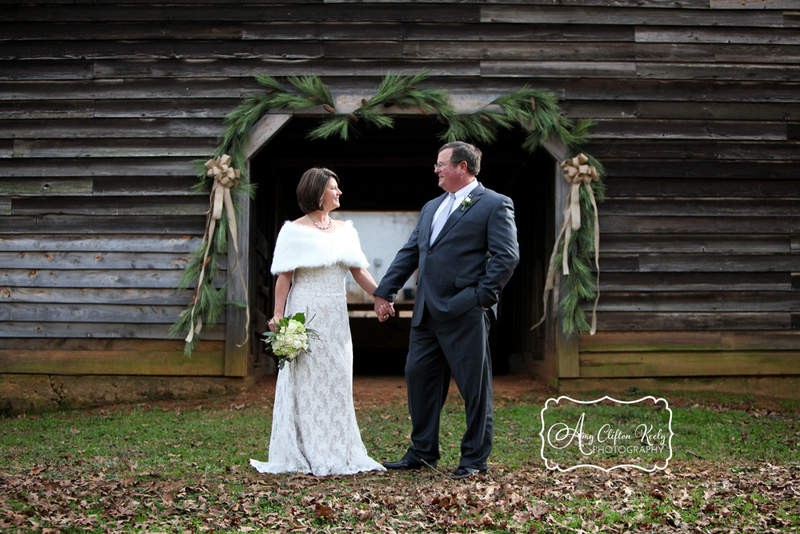 Angela’s gown from The Poinsett Bride was beautiful! JB proposed during a walk on the beach, searching for shells. He presented Angela’s diamond on this Lettered Olive shell–the state seashell of South Carolina! And Angela’s amazing blue velvet shoes?? LOVE!! Angela’s bouquet was the perfect blend of traditional Southern sweetness with a bit of rustic evergreens. Bouquet designed by The Embassy Flowers in Greenville. Angela’s precious friend Frances was their officiant, and it was such a meaningful part of their wedding day. Frances is beautiful inside and out, and she is fighting stage 4 breast cancer. This tough lady had chemo the day before the wedding, but she was completely perky and enthusiastic and shared her heartfelt prayers for her friends during the ceremony. So aside from how personal an elopement ceremony is, my next favorite part is that I have time to photograph a complete portrait session with the bride and groom!! Normally, we’re scrambling for time after a wedding, so it was a dream come true (well, maybe not JB’s dream 😉 ) to ramble around the property for “Couple Portraits.” Woohoo! Told y’all I loved this woodpile and shed!! Another of my favorites!! Angela is a consultant for Stella & Dot, and her necklace is gorgeous!! I can connect you with her if you’d like to see the collection or host a party! Once we got to the house, JB and Angela’s family/paparazzi were waiting to congratulate them! Their cakes were made by Angela’s friend’s mom as a gift, and their yummy food was catered by Mary Frances Brock of Key West Connection. I am obsessed with the old black & white family photos of JB’s family. I want to do a similar wall in our house!! The rings! It all feels real now! Sweet, sweet moment between JB and Angela’s mom. It’s a wonderful thing to love your in-laws! These two just started slow-dancing in the living room. Love love it! And finally, a couple of my favorite wedding portraits of the bride and groom! After wandering throughout the property, JB was about done with pictures, but we convinced him to go to just oooooooone more spot. I knew that the gorgeous pine trees would make a beautiful backdrop. JB–thank you for indulging us!!! Totally paid off! Angela and JB, I cannot thank you enough for allowing me into your love story. Your wedding–my final wedding of 2013–was absolutely perfect, and I wish you a lifetime of love and laughter! Friends, if you know someone having a small, personalized wedding or someone who is eloping at home or afar, please put them in touch with me! As always, it’s great to know you’ve stopped by! Please leave a comment below to show us some love, scroll over an image to “Pin It” to Pinterest, or click “Like” below to link to your facebook page! Awesome stuff. Love your work!